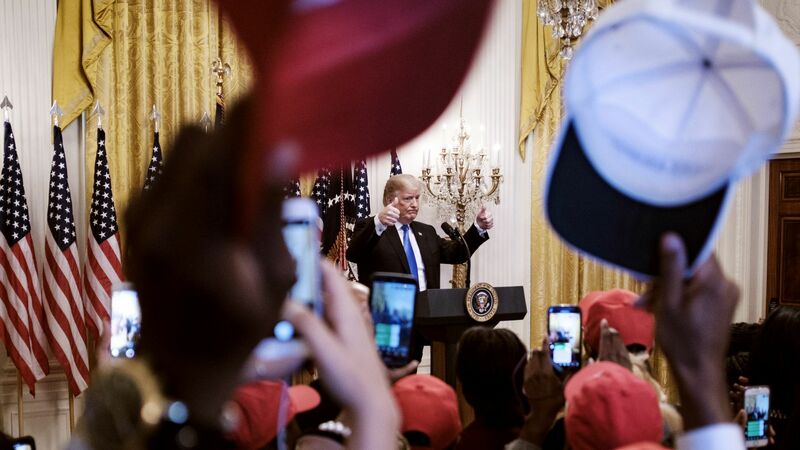 President Trump fed off the energy of hundreds of young black conservatives yesterday who piled into the White House in red MAGA hats to hear him speak, later telling Charlie Kirk, a prominent Trump supporter and founder of Turning Point USA, that unlike most speaking events at the White House, he "loved" this one, comparing it the feeling he gets during rallies, Kirk told Axios. Why it matters: In recent weeks, Trump has boasted about his rising popularity among African Americans, touting the low unemployment rate and pointing to his work with Kanye West and football legend Jim Brown. But despite his recent rhetoric and claims of newfound support, Trump is still severely unpopular among black voters. According to the latest Gallup ranking, only 10% of black voters approve of the job he's doing. The details: Trump's appearance Friday was part of the inaugural Young Black Leadership Summit, sponsored by Turning Point USA. It came less than two weeks before the midterm elections, where both young and minority voters are expected to turn out in high numbers for Democrats. During the event, Trump told a cheering crowd that Democrats are to blame for “wiping out good paying jobs” in the black community and for fueling the high crime and poverty rates in inner cities. Afterward, Trump stayed to sign hats and "work the photo line": "He had them throwing themselves at him telling him he's the greatest," Kirk told Axios. The backdrop: Kirk, a longtime friend of Donald Trump Jr.'s, told Axios that Jared Kushner, who has led several of the administration's criminal justice efforts and helped facilitate bringing West and Brown to the White House, was key in arranging Trump's appearance before the group. Don Jr. has also been very supportive and helped kick off the summit with Kirk. Following the president's speech on Friday, Don Jr. told Axios: "I have been doing 3-5 rallies a day for over a month and have never felt that kind of genuine excitement and have never seen that kind of emotional response from an audience. Truly Incredible!"